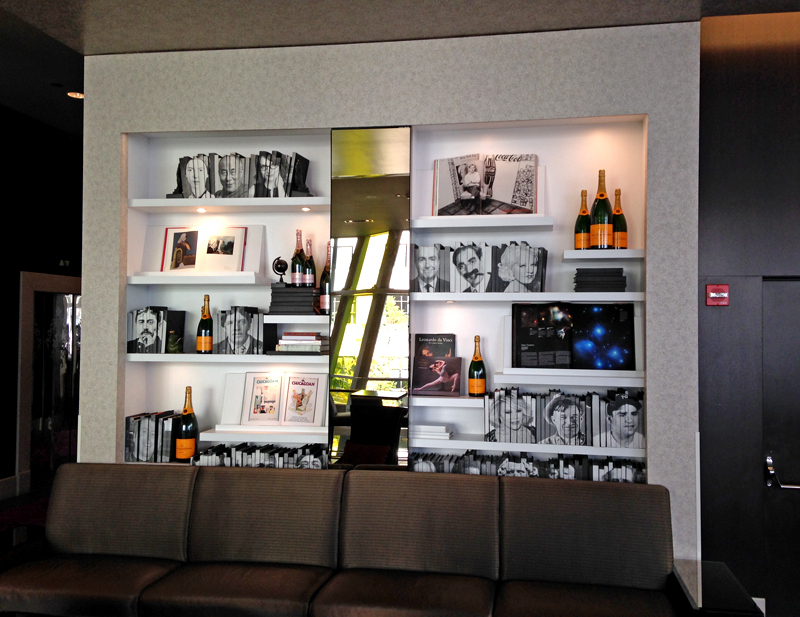 This past weekend I spent a night at The Wit hotel in Chicago and noticed the floor-to-ceiling bookshelves in this lounge. See those faces? Let's look closer. 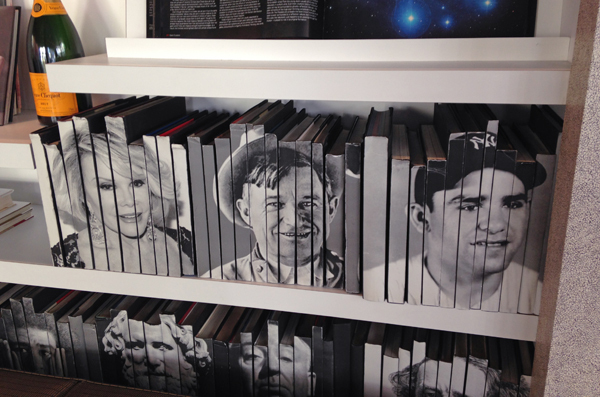 All of those black and white portraits are formed from the spines of books. If you need a statement wall in your house, copy this idea! Print and slice up a mix of celebrities, artists, and world leaders, or immortalize your family and friends. 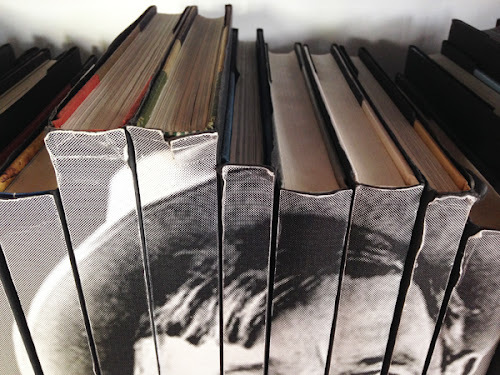 You're not reading that set of encyclopedias anymore, are you? Repurpose them as artwork. Me too. It made me really happy. Whoops, Mum, I was replying to Laura but you sneaked in there. I like the idea. There is something perverse in me that wants to reorder them though! 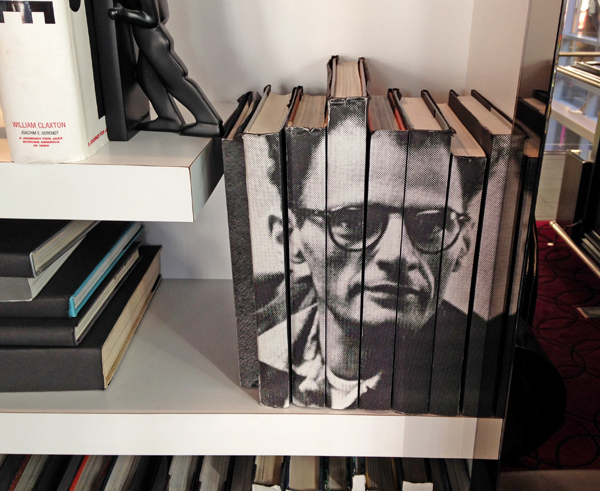 Actually we can get one step weird-er and we can put the writer's face on his/her own books. Dickens,Steinbeck,Heinrich Böll in one place! That's what I was thinking. If you have a collection by one author, this is a great way to group them. I am actually going to do this! OR do some sort of filing box for a certain amount of DVDs with a photo representing whatever is in that box? I am crazy about this idea. I can hardly wait to update my bookshelves :) THANKS!!!! Love the originality of this idea. So cool and unique. wow, i love this idea. though i'd probably not do this on my favorite books.